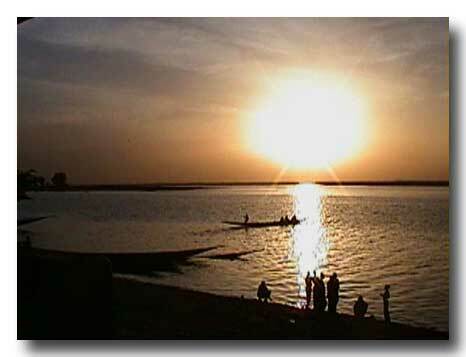 Situated on an island in the Niger Inland Delta with a population of around 10,000, Djenne is one of Mali’s preeminent tourist attractions. Named a World Heritage Site in 1988, the city has taken great care to preserve the mud architecture, including the world-famous mosque. You can easily feel what sub-Saharan Africa must have felt like a century ago. At one time, Djenné was competing with Timbuktu as the western Sudan’s preeminent center of trans-Saharan trade and Islamic scholarship. Now it is more of an agricultural (and tourist) town. 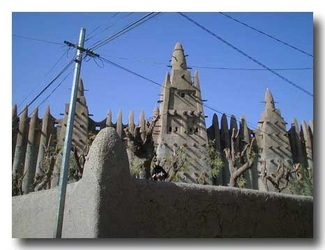 Djenne’s most famous (and dominating) site is the mosque. It is actually the third mosque built at the site. 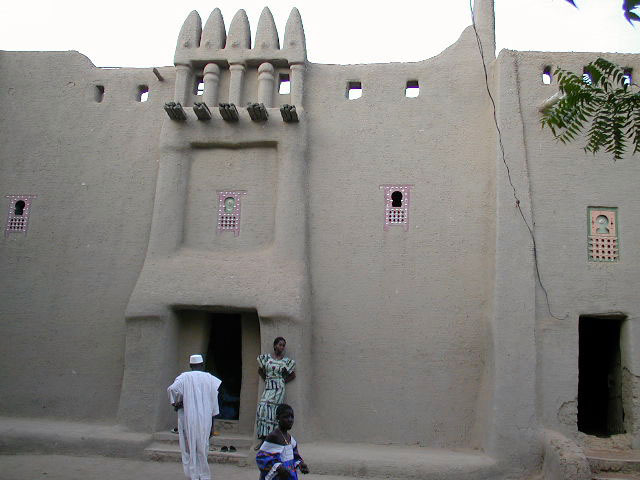 The first mosque was built by the Soninke king Koï Kounboro who destroyed his palace in the 13th century for its construction. The second mosque was built in 1834 after the first one was left to ruin after it became "contaminated" by evil practices. The present mosque, built in 1905, is in the style of the original mosque. Three towers, each 11 meters high and topped with an ostrich egg, can be seen from quite a distance. In fact, the mosque is the worlds’ tallest mud building. It is built in two years with handmade mud bricks, formed with a banco mixture of soil, water, and straw/grasses which become ripe after on e month. Wooden beams protruding from the building serve an aesthetic purpose as well as scaffolding, to repair the building after the rainy season. We arrived in Djenne on the day of the Ramadan feast. Everyone was wearing their new boubous, hats, and had their hair intricately done. Men had clean new haircuts, while the women and girls braided their hair, often with beads and other ornamental decorations. After walking through the narrow alleys, we climbed up to the top of a few buildings to get an aerial view of the city. From that vantage point, we could see the bustling crowds, the city’s many goats, and the mud architecture, either of Moroccan or Tukulor style. The tops and windows of the buildings were especially impressive. In addition, the Tukulor houses have an overhang over the door, presumably to protect it from the rain. 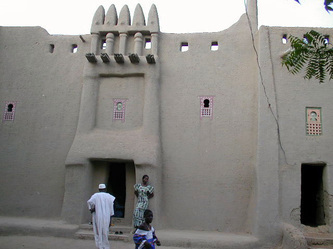 Just 2km from the town of Djenne lies the ancient town of Djenne-Jeno. Although it is difficult to see much more than some remnants of the handmade bricks of a building and tons of pottery shards, the site is the oldest known sub-Saharan city – dating back to the third century BC. A highly developed society of about 10,000 inhabitants, the site was mysteriously abandoned in the 14th century. With only the sound of the wind, the place was eerily quiet. The open area was covered with pottery shards, including some nearly complete lids. A special guide from the Mission Culturelle accompanied us to the site (the only allowed way to visit), offering us more insight as to what we were seeing as well as to help deter artifact pillaging. Prior to visiting the site, we went to the Mission Culturelle, where we saw informative displays including examples of pottery, sculptures, and iron, which helped give an idea of what was discovered at the site in 1977. 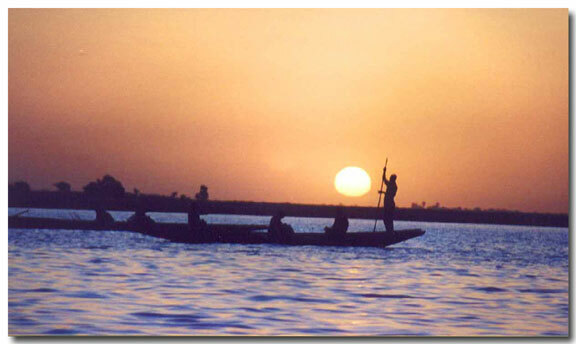 Built on three islands connected by dikes, Mopti is the country’s major route intersection. 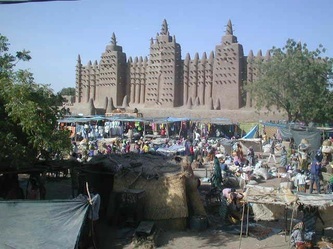 Peoples from many groups call Mopti home, including the Bambara, Songhai, Fula, Tuaregs (and their former slave – the Bellasha), Moors, Bozos, and Dogon. 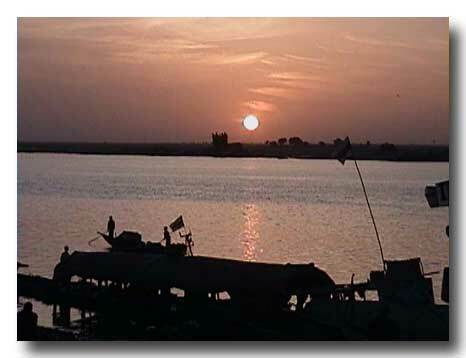 Once a Bozo fishing village, it has the largest river port in what was the French Sudan and now has about 100,000 people. 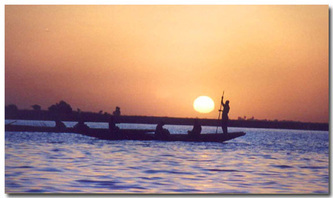 Pirogues and their larger counterparts, pinasses, carry goods up and down the Bani/Niger River. 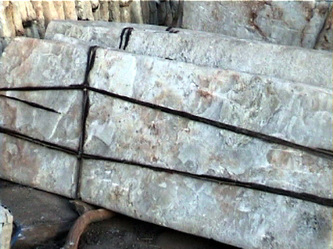 Transport is even possible to Timbuktu during and after the rainy season. 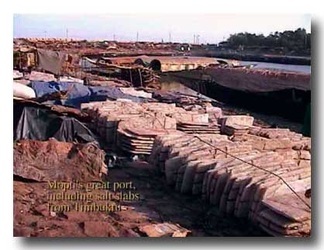 While in Mopti, we walked over to the busy port. Here we saw slabs of salt and other items that had come from Timbuktu. People were boarding pinasses and pirogues, for either transportation or fishing. The Niger river as well as the converging Bani river is much higher than what the Niger is in Bamako. Fishing continues to be of great importance. We also walked through the older part of Mopti. While it too had mud architecture, neither the mosque or houses were as impressive as those in Djenne. On the second day we took a pinasse to the opposite side of the Niger River, to a Tuareg slave village and then to a Bozo village. Like children at other villages, the Bozo children followed us, full of curiosity. However, their energy levels and demands for bics (pens) and bonbons (candy) far overshadowed any others. In the evening, we were treated to a glorious sunset while traveling by river back to the hotel.